Seven originals and a CELTIC FROST cover in less than half an hour. Is it an EP? Is it an album? I say it is a full length, debate at will. For Winnipeg’s VOTOV, the self titled release is representative of their first proper release. And man, is it dense. Spend enough time lurking around the central Canadian metal scene and sooner or later you will run into Chuck Labossiere and/or John Duke, lifers before some of these young whippersnappers even had life, and in the interest of transparency, friends of mine for about 15 years. Through various incarnations, these two men wave the flag of dense, riff heavy metal carnage and are not afraid to pay homage to their influences nor to be truly captivating personas and persons. I mean, hell, Chuck used what I think is possibly real bones and/or sticks as a mic stand back in the day and briefly fronted BORKEN HOPE as a touring vocalist. John is basically metal dad. Enough said. VOTOV is probably one of the neatest band names I have come across in some time, so much so I had to research its meaning and I encourage you to do the same. And now, onto the debut of VOTOV. The era seems ripe for several acts to be going for the cavernous sound, reverberations from the cave dwelling and the knuckle dragging Neanderthal in an inauspicious attempt at sounding, well, cavey. And I get it, I enjoy a whole lot of it, but VOTOV come equipped with a crisp production from their cave that harnesses the power of the low end without sacrificing the clarity of instrumentation. Sludgy but not sloppy, sharp in delivery, and utterly guttural thanks to Labossiere selling his soul years ago to gurgle from the very depths. 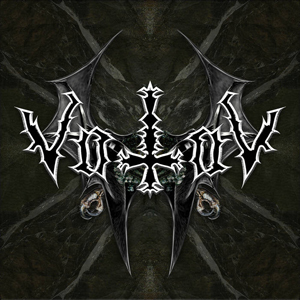 At times the songs can tend to swim together within their muck but that is a part of the charm here of VOTOV, a young band comprised of experienced players who are well aware of the sound they want - a sound firmly rooted in Obituary era CELTIC FROST. Yes, that makes sense. There is no flash here, no panache, this is down ‘n’ dirty death metal made to warm your soul. The riffs ring for years, the bass rumbles like a dinosaur in a tar pit, Matt Penner’s drumming is squarely in the pocket absolutely all the time. If you want something you can nod your head to without realizing it, check out Votov. The above notwithstanding, simplicity does not belie a lack of vision. Too often we extol the virtues of metal being too tech for thou and it is refreshing to hear it stripped back down to a basic stomp, eyes rolling back aural euphoria where the king is the rhythm, not the polyrhythm. VOTOV embody the beginnings of death metal (as does everything Chuck touches) but with a modern sensibility. The only direction here is upwards. And downwards. Just bang your head.